Here is one of our favorite things to make for dinner. It’s perfect for the person in your family who is lactose intolerant. You can make one side of the pizza with soy cheese, and one side with regular cheese. It works perfectly for me and my husband, and I get my pizza fix without worry. I even get to satisfy my cheese cravings by adding a sprinkle of goat cheese crumbles. Goat cheese has less lactose than regular cheese. It bothers me in excessive amounts, but just adding a tiny sprinkle enhances the buffalo chicken and cheese flavor. If you can’t do any goat cheese, then eliminate it altogether, or just add it to your significant other’s side of the pizza. But it is a good alternative for people who have mild lactose intolerance. 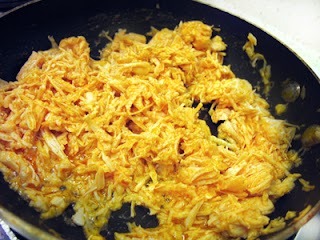 You can also try adding Parmesan cheese on top of the soy cheese to give it a more authentic cheese flavor. Hard, aged cheeses lose most of their lactose in the aging process. That means small amounts shouldn’t bother someone with lactose intolerance. There are lots of cheese alternatives out there. 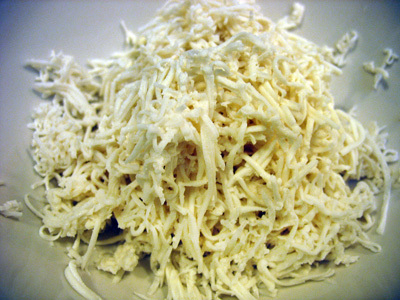 My favorites are Trader Joe’s Soy Mozzarella and Daiya Mozzarella Style Shreds. I have only been able to find Daiya items at Whole Foods and Costco. Daiya cheese alternative is also gluten and soy free, so it’s perfect for people with multiple allergies. I don’t usually eat a cheese alternative by itself, but when combined with other ingredients soy cheese blends in just like the real thing. 1. 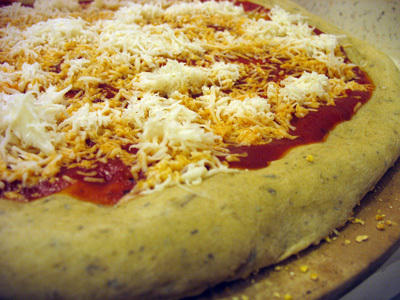 If the pizza dough is refrigerated, let sit for 20 minutes before rolling. 2. Preheat the oven to 500 degrees Fahrenheit. 3. For the crispy on the outside, soft on the inside pizza, use a pizza stone. Heat in the oven for ten minutes before placing the pizza on it. You can also use a regular non-stick pan, just make a square shaped pizza. If you have a large flat cookie sheet, you can make a circular pizza on this. Or, if you have it, use a circular pizza pan. 3. In a small pan, combine the chicken and 1/4 cup of Buffalo Sauce. Cook until heated and the sauce is absorbed into the chicken. 4. On a clean surface, sprinkle a thin layer of flour. 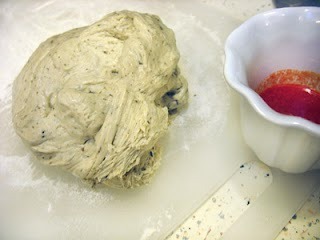 Roll out the pizza dough with a nonstick rolling pin, adding more flour as needed. 5. 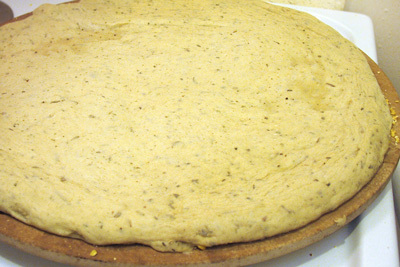 Remove the pizza stone from the oven and sprinkle with course grind cornmeal. Don’t use flour–it will only burn and your pizza will stick. 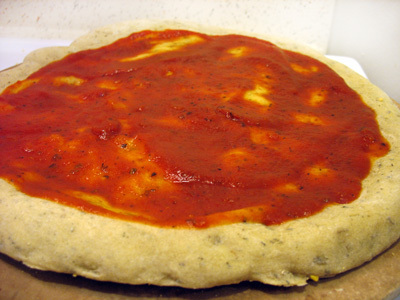 Place the rolled dough on the pizza stone, rolling up the edges to make a crust if you desire, and cook in the oven for three to four minutes. 6. Remove the cooked pizza crust from the oven and get ready to put on your toppings. 7. Spread the tomato basil marinara sauce on the pizza evenly. Using too much sauce will make the pizza soggy and hard to cut, but some people like their sauce, like me. 8. Sprinkle on your desired amount of soy mozzarella cheese. 9. 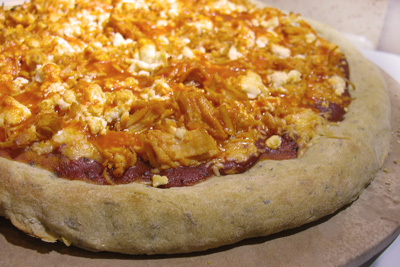 Next, add the Buffalo Chicken in an even layer, topping with a sprinkle of crumbled goat cheese. 10. 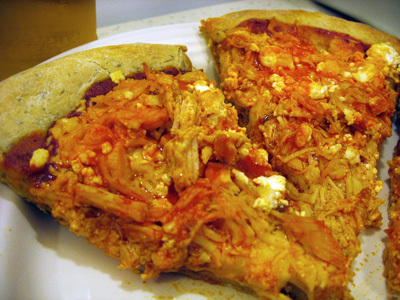 For the last topping, drizzle the 2 tablespoons of Buffalo Sauce all over the pizza. 11. Place in the oven and cook for 6-8 minutes, or until desired crispiness. Thoroughly enjoy.